This book is a partially fictional account of the Siege of Sarajevo. The truthful part of the story is that on 27th May 1992, during the siege, several mortar shells struck a group of people waiting to buy bread. Twenty-two people were killed and at least seventy were wounded. For the next twenty two days Vedran Smailovic, a local cellist, played music at the site in honour of the dead. 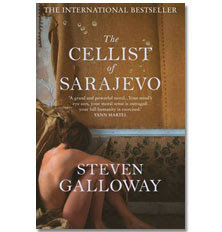 The actions of this one person inspired the novel and Galloway wrote fictional accounts of three different people's lives living in Sarajevo during this time. Each person's story was based on accounts from that period. Galloway' s three characters each face different battles. Firstly there is Kenan, who spends every fourth day laden with water bottles travelling across town, trying to avoid being shot at, in order to bring back enough water for his family and elderly neighbour. Each time he goes, he feels physically ill as he is unsure whether he will ever make it back to his family. Secondly there is Dragan, an old baker who no longer trusts anyone he knows and completely blanks out the people around him as he tries to get a meal each day, until someone he used to know gets shot. Finally there is Arrow, a young woman, enlisted by the city to shoot at the snipers and given the job of protecting the cellist whilst he plays every day. This was a really beautifully written book, but very sad to read. Knowing that the events in this book were based on actual accounts frightened me a little. This innocent town has once been full of life,where people shopped and worked and lived, just like our own towns. Then when the siege began, they lost their water supply, their electricity and food could no longer get into the town. People's lives came to a complete standstill; they were never sure whether a mortar might destroy their homes or whether they might get shot walking across the street. They lived in complete fear on a permanent basis. It really does not bear thinking about, but it is possible it could happen to anyone, anywhere. The book was written in the present tense, which I didn't feel added to the quality of the story The book is not fast paced, so I could not see a need for it. The characters are well written, you cannot help but submerge yourself in their fear. They were no different to any of us, they just wanted the opportunity to live. My favourite character had to be Kenan, as he struggled to hide his fear from his family, yet went out regularly to bring back water for them. He was so scared, yet so strong to continue to carry out this activity. The only part that bothered me within the book, was how death became a normality. The people of the town had learnt to accept it and dealt with it quickly. I found that so hard to understand, yet it must become reality in countries where death occurs on a regular basis. Personally, I would find it hard to deal with and I could never imagine death becoming a normality. Here is a passage from the book that really shows the attitude to death within the town. Since the war began Dragan has seen three people killed by snipers. What surprised him the most was how quickly it all happens. One moment the people are walking or running through the street, and then they drop abruptly as though they were marionettes and their puppeteer has fainted. As they fall there's a sharp crack of gunfire, and everyone in the area seeks cover. After a few minutes, though , things seem to go back to what they now call normal. The bodies are recovered, if possible, and the wounded are taken away. No one has any way of knowing if the sniper who fired is still there or if he has moved, but everyone behaves as though the has gone until the next time he fires, and then the cycle repeats itself. If doesn't appear to Dragan to make much difference whether the shot hits or misses. It may have in the beginning, months and months ago, but not now. By the end of the book, you see a dramatic change within each character as they begin to stop fearing the snipers. There change of heart is brought on by the actions of the cellist, where they realise they need to stand up to the people who are hurting them and be ready to take their town back when the siege ends. The cellist symbolizes hope and change to the people of the town and you begin to feel their hope for peace. I really enjoyed this book, however I feel that enjoy isn't the right word. This book moved me, it affected my emotions and pulled at my heart strings. It made me thankful for living the life I have. My only wish after reading this book, was that perhaps I should have read it during a different month, rather than during the run up to Christmas, as it made me feel quite sad, but then I thought that it was a good thing as during this time of giving, we should all spare a thought for those who are presently not living in an area where peace reigns and to think of all our boys out there fighting for us. My thoughts are with all the soldiers and their families this Christmas. I hope we get to bring you all home soon. A wonderfully well written post, I could tell that this story had really touched you. A beautiful review Viv. I ordered this one last year and left it sitting on my bookshelf. Thanks to your wonderful review I hope to pick it up early next year! This one really touched me, too. I don't know why it faded away so fast, but it did. That made me quite sad. What a beautiful post, Vivienne. It truly made me tear up. I've had this book on the wishlist for a while but I think I'll wait until a more advantageous time to read it. Unfortunately, you are right about it could happen anywhere, anytime. Fabulous review Viv. This book was very good--touching. It is sad to know that people in places like that have to accept death as such a normal part of life. I've had this book for a while. I'm glad to see it's so moving, but also realize I need to save it for the right time. I know what you mean about "enjoyment" not being the right word to describe a book like this. I felt that way about The Blue Notebook when I read it earlier this year. I've heard so many good things about this book, and hope to read it sometimes soon. I'm not a big fan of books written in the present tense though, but I usually can get past it if the book is good enough. I know what you mean about thinking about the soldiers at war. I just found out that my nephew signed up for the marines, and asked specifically to be sent to Afghanistan. The whole family is sad and worried, but at least he doesn't go to basic training until this summer. Your point about not reading this at this time of year is so valid. I have to be very careful this time of year to not get to carried away with deep emotional reads. Without family, it is tough enough just passing along each day. When you said you were thankful for living the life you had...that was so nice. it does sound like this book moved you, great review. I agree. Reading this book made me feel quite melancholy as well.